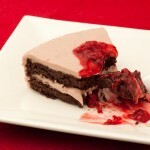 Moist grain-free and dairy-free cake made with cooked quinoa, blended with cocoa powder. Can be made egg-free (and vegan), too. In a medium size saucepan, combine coconut milk and honey. Cook on medium heat, whisking every-so-often until it comes to a boil. Meanwhile, in a small bowl, mix arrowroot powder and water. Add to saucepan. Continue to whisk icing until it thickens [about 1 minute]. Remove from heat and slowly add in coconut oil, whisking to combine. Place vanilla, icing mixture and raspberries in blender. Blend until smooth. Place icing in a glass container, leave on counter until cool, then place in fridge. Allow to cool in the fridge for 1.5-2hrs. Consistency should be that of icing. Once ready to ice the cake, whip up the icing with a hand blender. Combine milk, flax eggs, and vanilla in blender. Blend until smooth. In a large bowl, whisk together sucanat, cacao powder, baking powder, baking soda, and salt. Add the contents of the blender to the bowl and mix well with a hand mixer. 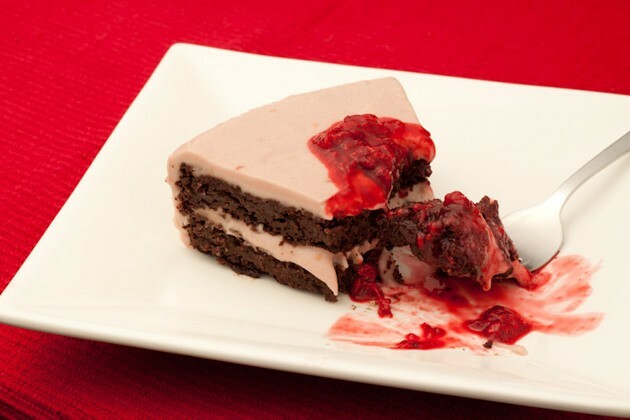 Serve with raspberry sauce drizzled over top.